Today is Clean Monday in Greece and we previously posted some traditional dishes. In addition to the dishes, it is traditional to eat a special type of bread called Lagana, which is flat and hasn't risen as much as normal bread. Usually people buy it from the bakers on Clean Monday, but you can also prepare it yourself. The photos show the Lagana we made this morning, fresh out of the oven! Dissolve the yeast and sugar in 200 ml tepid water. Sift the all-purpose and strong flour together into a mixing bowl so that they are mixed together. Create a dip in the centre of the flour gradually add the solution with yeast and sugar. Use a wooden spoon to lightly cover the solution in the centre with flour. Cover with cling film and leave in a warm place for 15 minutes, to let the yeast solution rise. After this time you should see some bubbles in the centre, indicating that the yeast has been activated. Add enough tepid water to make a pliable dough, not too sticky, similar to that for normal bread. Transfer the dough to a working surface and knead very well for about 15 minutes. Put back in the mixing bowl and let it rest for no more than 15 minutes in a warm place, because we don’t want the dough to rise as bread does. Place greaseproof paper in 2 shallow oven dishes, approx. 40cm x 30cm. Sprinkle 2 tablespoons of sesame seeds in each of the dishes. Divide the dough into 2 and place in the 2 dishes, shaping it and pressing it flat on top of the sesame seeds. Sprinkle 2 more tablespoons of sesame seeds on top of each one and press into the dough. Set aside the 2 dishes in a warm place for 20 minutes, to rise. Lightly press your fingers into the dough to leave small imprints all over the top (see photo). Bake in a pre heated oven at 200 degrees Celsius for about 40 minutes or until golden colour. That sounds delicious and don't think I've had this. Is it similar to pita bread? So strange! Yesterday for Valentine's Day hubby pulled out the stops and made the one dish that he's excellent at... an Italian dish (he's Irish, but can give an Italian a run for his or her money LOL!). 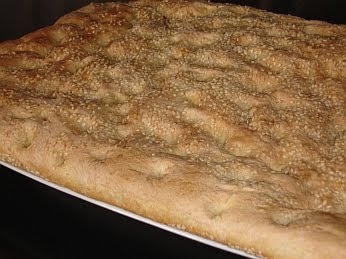 However, your recipe for Lagana Bread (and the picture itself) makes me hungry again! You wouldn't happen to know how many calories are in a serving would you?? I'm counting calories and it's working like a charm, but that sure looks yummy! @Poetic Shutterbug - no, it's not really like pitta bread, it's basically a 'flat' bread, because it hasn't been allowed to rise as much as normal. It's only produced and eaten 1 day every year in Greece - Clean Monday. By the way, it's really delicious with Gigantes (Butterbeans Plaki)! @Diane - I'm afraid we're not at all calorie counters! I'll see if I can get the information, but to be honest we never think about calories, so perhaps we're not the best people to ask! I'll try and check it out anyway. Well, after seeing the ingredients I think I can cook this one here in the Philippines. I'll try to make this one for my family. They will love this for sure. Traditional Lagana is yeast free, I'm hunting high and low for that one recipe, thanks all the same.